"Should we tell them?" asked Lucy. Wendy responded. "They need to know. We can trust the brothers, and the lunger seems like he's already attuned to what's really going on. They need to understand there's a greater evil than the cowboys." As Lucy and Wendy reflect back on what happened in the two years prior to their arrival in Tombstone, we learn the fate of what occurred to Mario Crane. The winner of the event decides if Mario can claw his way back from the abyss, or succumb completely to madness, and become a minor Servitor. The Runner-Up will help in making a decision regarding Jessica Prachett’s whereabouts (former Sloane). Each round of the event, a random table will help choose a card featured in the conflict. The players will discuss their card choice, and the winner of the round will report the decision. Thus these players will help determine the story’s direction. On the final round of Swiss for our event, this will automatically go to the final table. 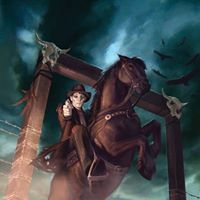 Attending PAX Unplugged but don't have a Doomtown: Reloaded deck yet? Come find a member of the Pine Box Entertainment team and we will provide you with one to participate in this major storyline event! Learn to Play demos also available. Not only that, we will have exclusive items for sale and hosting a community event the day before the convention. We hope to see you all there!